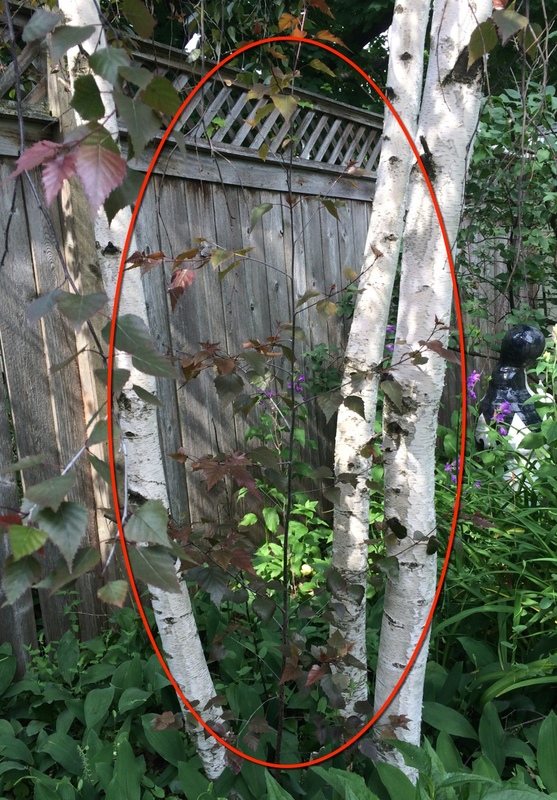 A natural born tree right in my own backyard! As some of my readers may have noticed, I spend a lot of time these days among trees, paying attention to trees, cutting back invasive trees to save native trees, etc. And one thing that I came to realize is that at least in an area like Chicagoland, humans tightly control the reproduction of trees. I live on a lovely tree-lined street. Big trees - 100 ft tall or more. Maples, oaks, ash....but there are no baby trees, except for smallish trees that the city plants when they have to remove diseased trees (such as all the ash trees, under assault from ash borers). It makes me sad to think of how impoverished my immediate surroundings are, how unnatural. We don't even let trees - majestic living things that make our lives possible, that live through many of our own generations - live out natural life cycles. In fact, I have come to accept that trees planted singly along streets to enhance our lives are really just ornaments. If "a man is not an island" then certainly a tree is not a forest. And very few trees live naturally outside of forests of many, many trees. I feel so much better now. The (minimal) wildness of our garden (as in: no grass) made it possible for a birch seed to take hold and grow. A tree that humans did not plant and hopefully will allow to grow to maturity. Humans love to debate things like "Do plants feel?" Of course, it is terribly difficult for us to imagine such a thing - because the way that plants would think and feel would be so different from us. So we will likely never really be able to answer the question. Which means it would make a lot more sense to err on the side of caution and assume that trees and plants and creatures do feel, do think in their own way, do take joy in life. And watching this natural born tree grow, it is certainly easy to believe that it is joyful. I sure am. When using a Human Task the limitations of it (obviously) are that of a human task, meaning that the means to do some to do some pre- or post-processing for the activity are very limited. There are only a few hooks for Java call outs and XPath expressions, but as processing of that happens on the Human Workflow Engine this won't show up in Enterprise Manager, and error handling will be hard if not impossible. So, when you for example need to call a service before or after a human task (like sending a notification email) you better use a process. So unless you are sure that such pre- or post-processing will be not necessary, the safest option is to use a process with a human task instead. That will give you all the freedom you have with a BPMN process. The disadvantage is that you will not be able to expose the UI of the task on the Case tab in workspace. However, as for any case management application of a reasonable size you probably will have one or more human activities in a process anyway, and as from a user experience perspective it probably is confusing to have tasks on Task tab, and some of them also on the Case tab, I don't expect this to be a practical issue in most cases. Meaning that in practice you probably handle all tasks from the Task tab only and on the Case tab show only some overview screen. In ACM activities can be Manually Activated or Automatically Activated. Furthermore you can specify if an activity is Required, Repeated, and/or Conditionally available. The difference between manually and automatically activated is that in the first case the user explicitly starts an activity by choosing it from a list of available activities. Automatically activitated activites are for example used for some case pre- and post-processing, and for activities that always have to start at some point, and (optionally) given some specific conditions (like some milestone being reached or some other activity being completed). An example is that once a claim has been entered, it has to be reviewed before anything else can happen. Required activities should be completed before a stage is completed. Be careful though, as nothing is preventing you from closing the stage even though a required activity has not yet finished. If the user has the proper rights, he/she can complete an activity event even when no actual work has been done. There is no option to prevent that. However, in case of an automatically activated activity you can use business rules to reschedule it. For example, if the Review Complaint activity is required, and by that the complaint must have been given a specific status by the Complaints Manager you can use a rule to reactivate the activity if the user tries to close it without having set the status. Repeatable activities can be started by the user more than once. There is no point in checking automatically activated activities as being repeatable. An example of a repeatable activity can be one where the Complaints Manager invites some Expert to provide input for a complaint, and he/she may need to be able to involve any amount of experts. Conditionally available activities are triggered by some rule. Both manually as well as automatically activated activities can be conditional. If automatically activated, the activity will start as soon as the rule conditions are satisfied. In case of manually activated activities the rule conditions will determine whether or not the user can choose to from the list of available activities. Continuing my series on new 12c Parallel Execution features: I've already mentioned the new PX SELECTOR operator as part of the new Concurrent UNION ALL feature where it plays a key role. However, in general starting from 12c this new operator usually will get used when it comes to executing a serial part of the execution plan, like a full scan of an object not marked parallel, or an index based operation that can't be parallelized. In pre-12c such serial parts get executed by the Query Coordinator itself, and the new PX SELECTOR changes that so that one of the PX slaves of a PX slave set is selected to execute that serial part. There is not much left to say about that functionality, except that it doesn't get used always - there are still plan shapes possible in 12c, depending on the SQL constructs used and combined, that show the pre-12c plan shape where the Query Coordinator executes the serial part. First this plan shape only requires a single PX slave set since the Query Coordinator takes over the part that needs to be re-distributed, so although we have a plan shape that requires re-distribution there's only a single PX slave set involved. In case there is at least one operation that gets executed in parallel and requires re-distribution there always will be two PX slave sets. Second the plan shape demonstrates that parts of a Parallel Execution plan that get executed serially by the Query Coordinator require an additional BUFFER SORT operation. The HASH JOIN operation itself is blocking while it is consuming the left row source for building the hash table, so there is no true requirement to add another BUFFER SORT after the PX RECEIVE operation, but it looks like a pretty strict rule that any serial activity that involves the Query Coordinator adda a BUFFER SORT operation after re-distribution - I assume the reasoning for this is that the Query Coordinator isn't available for "coordinating" the PX slaves as along as it is actively involved in executing serial operations, hence the need to block any other parallel activity. This normally shouldn't be too relevant to performance since you should only execute operations serially that are tiny and not worth to run parallel, so buffering them shouldn't add much overhead, but it's just another reason why you see additional BUFFER SORT operations in parallel plans that are not there in serial-only plans. The 12c plan shape shows the new PX SELECTOR operator that executes now the serial part of the execution plan instead of the Query Coordinator. This also adds new decorators in the IN-OUT column called "SCWC" and "SCWP" respectivley, which you won't find in pre-12c plans - they are probably meant to read "Serial Combined With Child/Parent", similar to "PCWC/PCWP". The good thing about the new PX SELECTOR is that the need for an additional BUFFER SORT operator is now gone. However, one side-effect of the new operator for this particular plan shape here is that now a second PX slave set is allocated, although only one PX slave actually will get used at runtime. Note that for other plan shapes that need two PX slave sets anyway this doesn't matter. Another good thing about the new PX SELECTOR operator is that it avoids an odd bug that sometimes happens with Serial->Parallel redistributions when the Query Coordinator is involved. This bug causes some delay to the overall execution that usually isn't too relevant since it only adds approx 1-2 seconds delay (but it can occur several times per execution so these seconds can add up) and therefore is rarely noticed when a Parallel Execution might take several seconds / minutes typically. I might cover this bug in a separate blog post. Fixed an issue reading MaxL XML data sources when the alias or UDA contained xml encoded characters such as the ampersand (&) character. Updated labels on the Input Source tab of the user interface to clarify their purpose. Here is a screenshot showing the updated labeling. Due to the architecture of the Oracle Essbase APIs, it is generally much faster to use the MaxL Outline XML extracts when processing an Essbase Outline extract. 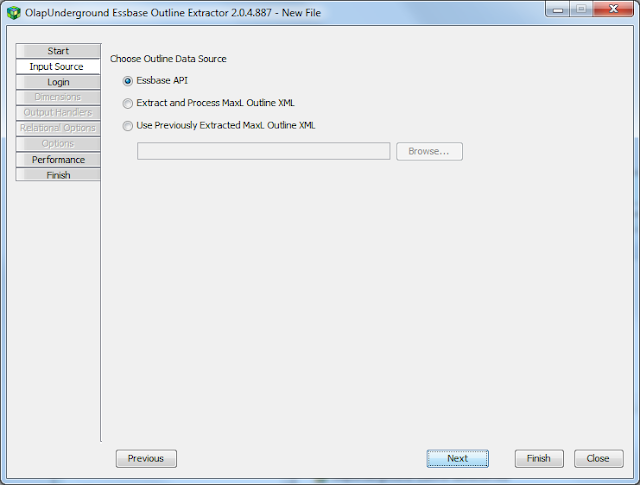 The Next Generation Outline Extractor still uses the Essbase Java API during this extract, but it is able to minimize the number of calls. The second option shown above, Extract and Process MaxL Outline XML, will automatically extract the Outline XML from the cube during the processing. The third option shown, Use Previously Extracted MaxL Outline XML, uses (obviously) an Outline XML file that has already been extracted. Thank you to everyone who reported issues or made suggestions as you help make this utility better! 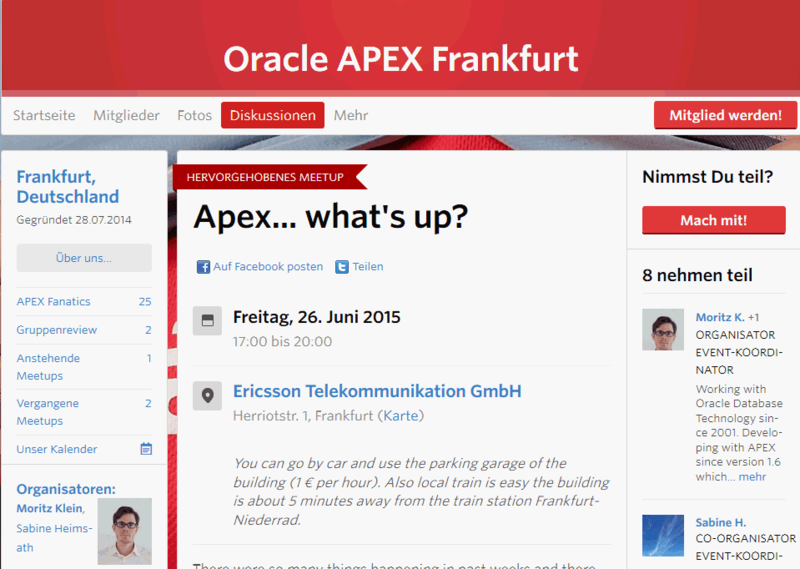 Am 26.06.2015 17.00 treffen wir uns in Frankfurt a. M. bei einem weiteren APEX Meetup. Danke an Sabine Heimsath und Moritz Klein für die Organisation. Ich zeige dort, wie man lokal eine XE Datenbank zusammen mit ORDS und Glassfish konfigurieren kann. Danach kann sehr leicht jede beliebige Version von APEX nachinstalliert werden. Der Vorteil ist, ich kann alle Features einsetzen (RESTful Services, XLS Upload) und der Austausch vo Images bzw. Konfiguration für die neue Version von APEX sind kein Problem mehr. Our next meetup is in Frankfurt on 26th of June. Thanks to Sabine Heimsath and Moritz Klein we will meet at Ericsson Telekommunikation GmbH Herriotstr. 1 Frankfurt. I will demonstrate how to install XE with ORDS and Glassfish and how to upgrade to APEX 5.0 on a local virtual machine. Speaking this week at a Marketplace LIVE event sponsored by Telx, a provider of hosting services, Anthony Anzevino, director of America sales for AWS, says the cloud giant focuses its own inside sales efforts on some 3,500 named accounts, which is then supplemented by some 5,000 systems integrators. Most of those customers, says Anzevino, are looking to find a more agile way to deliver IT services using a cloud service provider that is committed to innovate across a wide depth of product offerings. After all those factors are considered it's only then that the conversation turns to cost and pricing models, said Anzevino. The single biggest deterrent to making that sale, said Anzevino, is the internal IT organization. Unless there is some plan in place regarding how the skills of the internal IT staff will be reapplied to add value to the business Anzevino said most internal IT organizations will go to significant lengths to prevent application workloads from moving out to the cloud. Counterbalancing that influence, says Anzevino, is usually a chief financial officer that wants to outsource everything that is not core to the business. More often than not the CFO does not see IT as being strategic to the business and the real costs of delivering IT to any line of business inside that organization are generally poorly defined. For the most part AWS became the largest cloud provider by targeting independent software vendors (ISVs) that didn’t want to invest in IT infrastructure to deliver a software-as-a-service (SaaS) application. To fuel continued growth AWS is now targeting traditional enterprise IT organizations, many of whom are eager to at least move application development activities into the cloud. The battle comes when it’s time to move those applications into production environments. More often than not because of security, performance, compliance and total cost of ownership issues the internal IT organization will make a strong case for deploying production applications inside a private cloud or in a managed hosting environment. You can read the entire article for yourself here. The PeopleTools Customer Advisory Board is comprised of PeopleSoft technology strategists and a small group of customers that are leaders - both in their organizations and the PeopleSoft customer community as well. Our members are the decision makers who set directions and priorities for their PeopleSoft applications. Does your organization have a history of rapidly adopting new PeopleSoft technology? Are you working on your plan to implement Fluid UI and reap the rewards? Has PTF become a key part of your testing strategy? Have Engineered Systems changed what you do with PeopleSoft? Are you rolling out enhancements via Selective Adoption? Do you consistently evaluate new functionality and look for ways for your business to benefit from it? If you are one of the people we’re looking for and would like to be considered for the PeopleTools Customer Advisory Board, please contact mark.hoernemann@oracle.com to receive an application where you can share the criteria that set you apart from other customers. We are pleased to invite you to our Advisor Webcast series for June 2015. Subject matter experts prepare these presentations and deliver them through WebEx. Topics include information about Oracle support services and products. To learn more about the program or to access archived recordings, please follow the links. Live Essentials Webcasts, designed to help you better utilize Oracle's support tools and procedures. Many of the Oracle Product Support teams maintain support blogs. You may access the Support Blogs directly, or via the Product Support Blog Index. Watch this short video to see how to subscribe to a support blog of interest. June Featured Webcasts by Product Area: CRM Preparing Certificates for SISNAPI Encryption in Siebel June 18 Enroll Database How to Resolve Patch Conflicts with MOS Conflict Checker? June 23 Enroll E-Business Suite How to Understand and Resolve Mismatches Between APCC Reports and ASCP Data June 11 Enroll E-Business Suite eAM GIS Integration Options June 18 Enroll E-Business Suite Outside Processing (OSP) for OPM in 12.2.4 June 23 Enroll E-Business Suite Work In Process Scrap - Costing Overview June 24 Enroll Eng System Advanced Customer Support (ACS) - Solution Support Center for Engineered Systems June 30 Enroll JD Edwards JD Edwards World: Payroll & HR General Outline & Navigation - JDE World Payroll & HR Basics Part1/14 June 18 Enroll JD Edwards JD Edwards EnterpriseOne: P41203 Lot Management Workbench (Trace/Track Inquiry) Functionality June 23 Enroll JD Edwards JD Edwards World: Costed Routing (P30208) in Manufacturing June 24 Enroll JD Edwards JD Edwards EnterpriseOne:Troubleshooting Tips for AS400 related issues June 25 Enroll Middleware WebCenter Content - All about Oracle Text Search (OTS) June 24 Enroll Oracle Business Intelligence OBIEE11g セキュリティ概要とトラブルシューティング (Japanese Only) June 24 Enroll PeopleSoft Enterprise Using the Affordable Care Act Component Interface June 24 Enroll Copyright © 2015, Oracle Corporation and/or its affiliates. I have just finished my presentation on the smaller new features of Oracle Application Express 5.0 here at the APEX Connect conference in Düsseldorf ... it was a blast :). 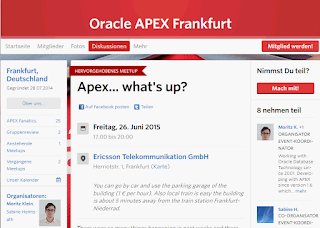 APEX 5 New Features - auch die Kleinen verdienen Beachtung!